A visit of the exhibit Jewelry of Ideas: Gifts from the Susan Grant Lewin Collection at the Cooper Hewitt, Smithsonian Design Museum in New York (ending May 28, 2018) gives a glimpse of the artistic complexity and intellectual challenge that characterize art jewelry. 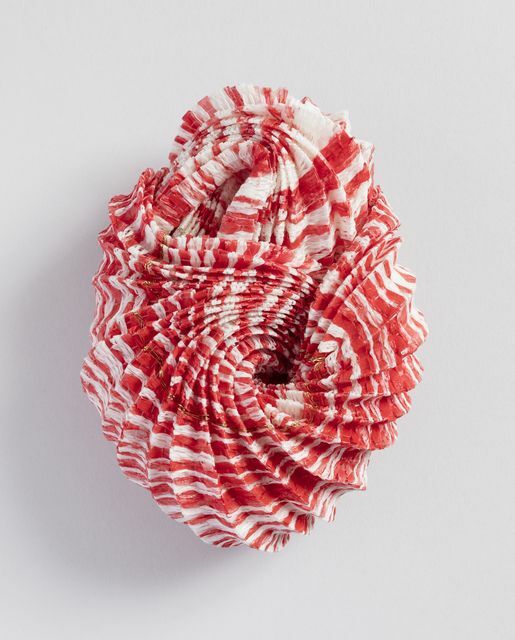 Brooch, 2015. Designed by Kazumi Nagano. Designed by Bruce Metcalf, 2004. Carved and painted maple, gold-plated brass, painted wood, plexiglass (case). Designed by Svenja John, 2002. Water jet-cut, surface treated, hand-colored and crafted polycarbonate (Makrofol). Contemporary art jewelry questions the notion of preciousness. Its value rests on the innovative techniques and materials used as well as the artistic intent behind each piece. Knowledge of the artist's intended message deepens the appreciation for the piece which is often not immediately appealing based on standard aesthetic principles. A piece of wood on a wire, the image of a soccer player as a brooch (even with a shinny crystal) are not the kind of jewelry most of us are accustomed to wear. Designed by Otto Kunzli, 1986. Picture frame fragment, wood, steel. Designed by Gijs Bakker and made by Tobias van Roojen. To fully appreciate the pieces requires a questioning of our relationship to jewelry, its value in our society, the hierarchy it has created, the interaction of our body with objects of adornment. Designed by Felieke van der Leest, 2006. Textile (viscose,polyester/polyamide), plastic heron, 14kt gold, glass beads, marcasite. Meticulously assembled over four decades, Susan Grant Lewin's collection reflects the breadth and depth of contemporary jewelry from the 20th and 21st centuries. The armchair traveller will enjoy reading the collection's catalogue that illustrates an extraordinary range of countries, artists, materials, techniques and societal issues. Jewelry of Ideas: Grant from the Susan Grant Lewin Collection, Cooper Hewitt, Smithsonian Design Museum, on view until May 28 2018. All photos from Cooper Hewitt Museum website. Front page bracelet: Bracelet, 2009. Designed by Gaetano Pexce. Polyurethane resin.